This design is an ADD-ON item*! It MUST BE PURCHASED ALONG WITH A PAIR OF SHORTS from my shop in order to have the patches. They are made to order. Placement & space around patch may vary from pair to pair, depending on the size and design of the shorts. Two patches per pair, placed similar to photo examples unless otherwise specified. 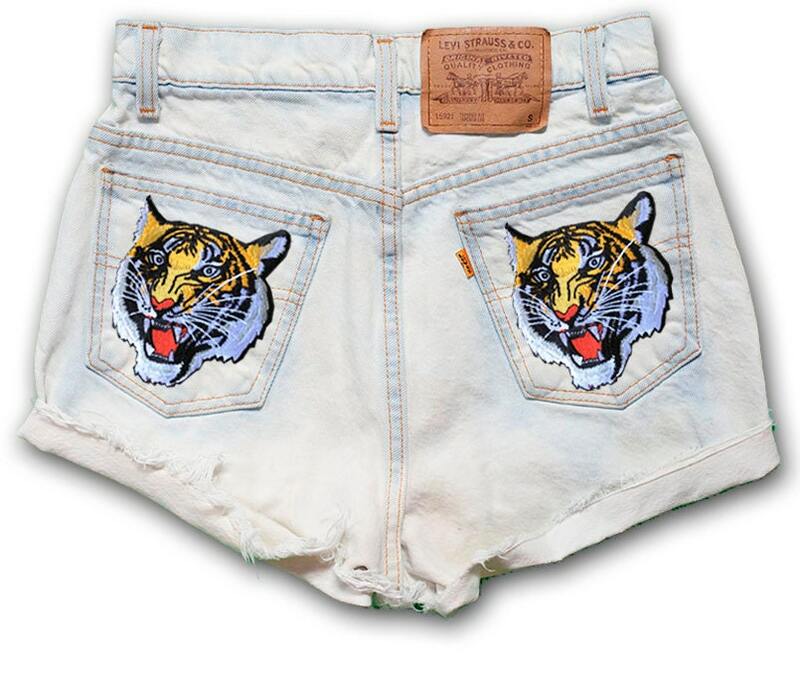 Almost all of the shorts in my shop are made from vintage high waisted Levi's or other denim. If you're interested in this design, check out my shop! This item ships with no extra shipping charge! Most items are shipped First Class (3-5 business days). If interested in more than one item, your package will be shipped Priority Mail (1-3 business days) for $2.50 per additional item (after base shipping fee of $4.29). International buyers pay $8 per additional item (after base fee of $22.50). If you'd prefer to have your individual item shipped Priority Mail, just shoot me a message prior to purchase and I will switch the shipping profile. Return policy lasts 30 days. If 30 days have gone by since the date of purchase, neither a refund or exchange can be offered. To be eligible for a return, item must be unused, unworn and in the same condition that it was received (with tags). To complete the return, proof of purchase is required. *If this item is purchased without the purchase of a pair of shorts, the order will be canceled unless a shorts order is placed immediately after. Disclosure: The patches and shorts used in all above listing photos, in addition to any orders placed, are not affiliated with one another, nor is Golden Garb, LLC affiliated with the producer of the patches. "Handmade Item" implies that I attach the patches to the shorts as a service.